Fighters from ISIL and its rivals who spoke to Reuters praised Baghdadi as a strategist who succeeded in exploiting turmoil in Syria and Iraq’s weak central authority after the U.S. military withdrawal to carve out his powerbase. He has proved ruthless in eliminating opponents and showed no hesitation in turning against former allies to further his ambition of creating an Islamist state. Enemies, even those from rival radical groups who broadly share ISIL’s religious ideology, are fought and defeated. Captured fighters – and non-combatants – are usually shot or decapitated, their deaths recorded in grisly videos which inspire fear and revulsion among opponents. According to the U.S. reward notice, which depicts a round-faced, brown-eyed man with closely cropped beard and short dark hair, Baghdadi was born in the Iraqi town of Samarra in 1971. He got a doctorate in Islamic studies at Baghdad university, jihadi websites say, and after years of fighting with al Qaeda groups became leader of its Islamic State in Iraq in 2010. A year later, sensing opportunity when the uprising against Syrian President Bashar al-Assad erupted, Baghdadi sent an aide across the border to expand al Qaeda’s foothold there. That aide, Abu Mohammad al-Golani, set up al Qaeda’s Nusra Front which quickly rose to prominence with a series of deadly car bombings. It also earned a reputation as the most effective of the many disparate forces fighting Assad. But as Golani grew strong in Syria and rejected an edict to merge his forces under Baghdadi’s command, Baghdadi launched a war against the Nusra Front, leading to a split with al Qaeda leader Ayman al-Zawahri. For many of Baghdadi’s supporters the clash between their battlefield commander and the nominal but distant al Qaeda leader, who tried in vain to impose his authority to end the dispute, was no surprise. When al Qaeda founder Osama bin Laden was killed by U.S. forces in Pakistan three years ago, Baghdadi “was the only one who did not pledge allegiance to Zawahri,” the non-Syrian ISIL member said. Ibrahim Awwad Ibrahim Ali al-Badri al-Samarrai (Arabic: ابراهيم عواد ابراهيم علي البدري السامرائي‎), most commonly known as Abu Bakr al-Baghdadi (أبو بكر البغدادي), also as Dr. Ibrahim, Abu Dua (أبو دعاء), and Caliph Ibrahim, is the Caliph—head of state—of the Islamic State and former leader of the Islamic State in Iraq and the Levant (ISIL), alternatively translated as the Islamic State in Iraq and Syria (ISIS). The formation of the Islamic State in Iraq and the Levant was announced on 8 April 2013 in a statement by al-Baghdadi. It is the successor to the ISlamic State of Iraq(ISI) militant group (aka Al-queda in Iraq or AQI), which was the Iraqi division of the international Islamist militant organization al-Qaeda. On 4 October 2011, the US State Department listed al-Baghdadi as a Specially Designated Global Terrorist and announced a reward of $10 million for information leading to his capture or death. Only Ayman al-Zawahiri, chief of the global al-Qaeda organization, merits a larger reward ($25 million). In 2014, it was reported that Al-Baghdadi was in US custody in 2005, and was held at Camp Bucca, a US-controlled detention facility in Iraq, until he was transferred to Iraqi control in 2009 and released later that year under an agreement signed by President George W. Bush the previous year. During an interview, US Army Col. Kenneth King, the commander of Camp Bucca at the time of al-Baghdadi’s detention, verified his containment and release in 2009, and revealed that al-Baghdadi’s departing words were: “I’ll see you guys in New York.” However, according to US Department of Defense records, al-Baghdadi was held as a “civilian internee” at Camp Bucca by US Forces-Iraq from early February 2004 until his release in early December 2004. A Combined Review and Release Board recommended the “unconditional release” of al-Baghdadi and there is no record of him being detained by the US at any other time. 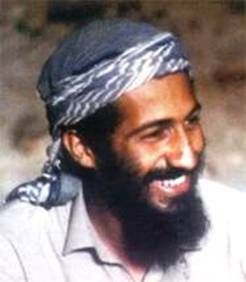 The young Osama bin Laden 2000..